In North America, shared borders stimulate trade. Mexico’s top trading partner is the United States. The United States’ top trading partner is Canada, followed closely by Mexico. In this briefing, we compare and contrast crude oil production in Mexico and the U.S. Both the U.S. and Mexico possess massive oil resources. Mexico nationalized its oil sector in 1938, and its industry evolved as a state-run monopoly led by Petróleos Mexicanos, or Pemex. After years of declining oil production and disappointing investment, the government changed the constitution to end Pemex’s monopoly and to seek private investment. In 2015, Mexico held auctions for onshore and offshore blocks to promote exploration and production. Pemex retained the right of first refusal on developing domestic resources, before the offerings were opened to public bidding. This phase is known as “Round Zero.” Interest from international companies was disappointing, in part because of low international oil prices. The auction rules were modified to encourage more bidding in subsequent rounds, but it remains difficult to attract investors. Mexico’s offshore crude production also has been subject to disruptions caused by tropical storms and hurricanes. Adding extra challenges: Oil distribution is plagued by theft. Pemex has reported literally thousands of illegal taps into pipelines, some of which have caused spills and even explosions. 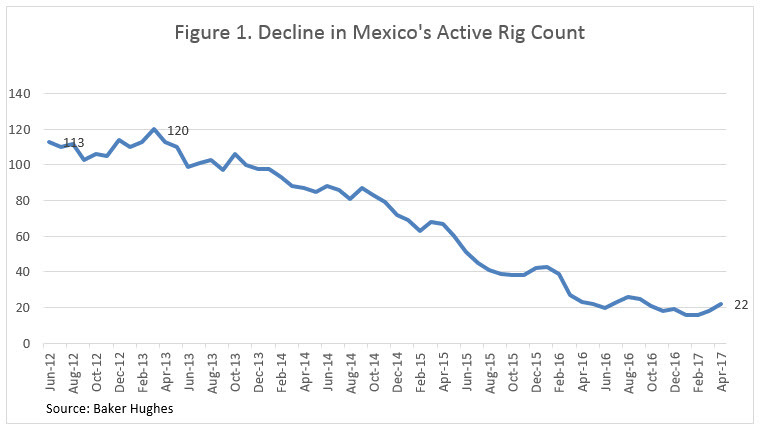 As Figure 1 illustrates, Mexico’s active rig count has been sliding downward. According to Baker Hughes, in 2012, Mexico’s rig count was in the range of 105-115. A peak of 120 was reached in March 2013. 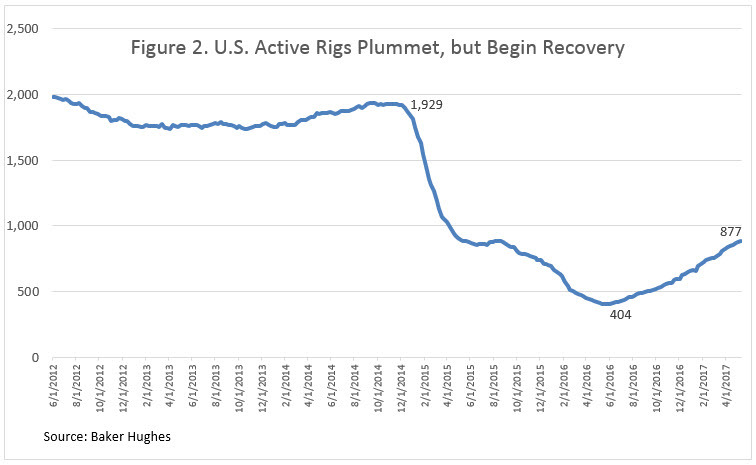 By the end of 2013, the rig count slid below 100, and it continued to dwindle. In April 2017, the rig count stood at only 22. In contrast, Figure 2 presents the trend in the U.S. active rig count, as reported by Baker Hughes. The oil price war during 2014 and 2015 took a massive toll on the U.S. industry. The rig count plummeted from around 1930 in late-October 2014 to 404 in May 2016. Yet the low prices and fierce competition raised the efficiency of the U.S. industry, and the rig count began to rise again. As of April 2017, the U.S. rig count had recovered to 877. 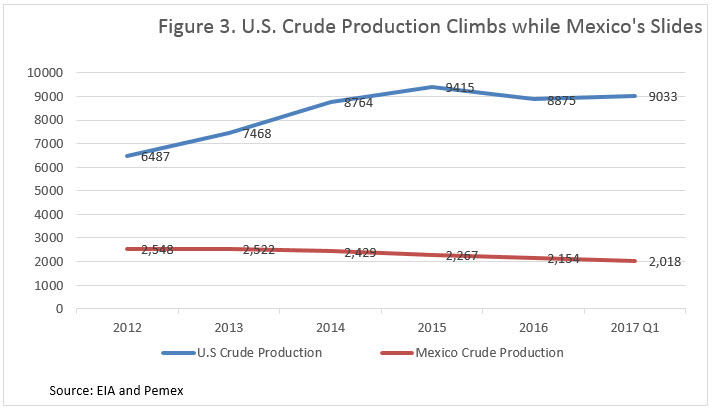 Figure 3 compares the trend in U.S. crude production with Mexican crude production. According to the U.S. Energy Information Administration, U.S. crude production hit a peak of 9415 kbpd in 2015, but began to decline during the latter half of that year. In 2016, production averaged 8875 kbpd, a drop of 540 kbpd. As U.S drilling efficiency and the rig count began to rise, however, the production decline hit bottom, and production began to rise again. Production regained the 9-million-barrel-per-day mark in February 2017. U.S. crude production averaged approximately 9033 kbpd during the first quarter of 2017. According to Pemex, Mexican crude production has continued its downward slide. In 2012, production averaged 2548 kbpd. Production declined to 2154 kbpd in 2016, and it fell to 2018 kbpd on average during the first quarter of 2017. Although the U.S. picture has been more variable, between 2012 and the first quarter of 2017, U.S. crude production has grown by 2546 kbpd. Mexican crude production has fallen by 530 kbpd. The waning of Mexican output and the robustness of the U.S. industry is illustrated further by Figure 4, which shows the rise and fall of Mexico’s crude exports to the U.S. In 1993, the U.S. imported 863 kbpd of crude from Mexico. 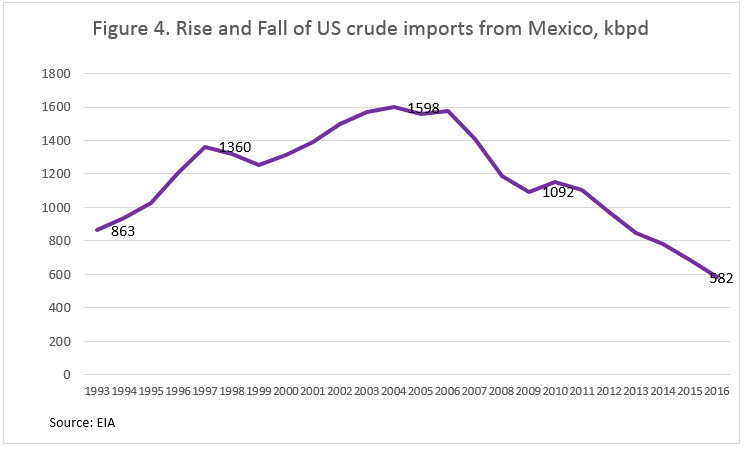 Imports of Mexican crude grew to a peak of nearly 1600 kbpd in 2004. Thereafter, the U.S. Shale Boom was underway. Not only did U.S. import requirements begin to fall, but Mexico had less and less to export. Mexico remains an important supplier of crude to the U.S., but in nominal and percentage terms, exports have fallen sharply. Mexican crude imports of 1400-1600 kbpd used to account for 14%-16% of total U.S. imports, but in 2016, Mexican crude imports of 582 kbpd accounted for 7.4% of U.S. imports. Mexico’s oil industry has not thrived as a state-run monopoly. Oil exploration and development have languished. While the government has now opened many resources for public bidding, the terms have not been attractive enough to reverse the downturn, particularly in the current situation of global oversupply. Although the state-run oil industry may shield consumers from extreme volatility, it also seems to miss upside opportunities. In contrast, the U.S. upstream industry is rebounding. The rig count in Mexico has slumped, while the U.S rig count has been growing both in number and efficiency. While Mexico remains an important partner in oil trade with the U.S., Mexican crude exports to the U.S. have fallen sharply. Moreover, as we will discuss in an upcoming article, Mexico has become a major importer of refined fuel from the U.S. Mexico has long-standing plans to expand its refinery capability and to reduce dependence on imported fuel. These plans have been stymied by lack of capital and poor economics, since refined product from U.S. refineries is so readily available. For the time being, therefore, more emphasis may be placed on continuing to open the oil sector to private investment, and waiting for supply and demand to move into better balance. This may be an advantageous strategy, since several agencies and investment houses have cautioned that the past two years of low oil prices have stunted upstream investment, and that the oversupply could quickly tilt to shortage. This article is part of CrudeTagged crude, Mexico, production, trends, U.S.